Last year I did two things I almost never do: I played a game that was in early access (that’s one), that I bought on my PC (that’s two). I don’t touch early access unless it’s for work, and I don’t play games on my computer because I’m already in front of this screen too long every day as it is. This wasn’t just any game, though: it was Fire Pro Wrestling World, the latest version of the best wrestling series ever, and the first real one to hit the States in over a decade. Even with a PlayStation 4 version on the way, I couldn’t wait, and despite the extra time spent in front of my computer, it was worth it—it made our list of the best PC games of 2017, and it would’ve ranked high on our overall best of list if we put early access games on there. Fire Pro Wrestling World possesses everything that’s made this series so important, from the realistic match flow to the extraordinary degree of customization, while introducing online play and the ability to download other players’ creations, and that’s why I played it more in 2017 than any game not named Breath of the Wild. Well, I think I know what I’ll be doing with the rest of my 2018: Fire Pro Wrestling World is finally out on console, and it’s just as good as it was last year, but with even more to offer. That more, specifically, revolves around New Japan Pro-Wrestling. The top wrestling promotion in Japan is more popular than ever in America, with an American TV deal on AXS TV, a streaming app that broadcasts all their major shows live or on demand, and a series of official NJPW live events that have brought their more sports-like presentation to American soil. Along with their American partner Ring of Honor, New Japan has even sold out a show at Madison Square Garden in New York—the first non-WWF/WWE wrestling show allowed in that building in more than 40 years. New Japan has made a concerted effort to establish an American beachhead over the last few years, and releasing a videogame in America that heavily features their wrestlers is just one of many steps along that path. Fire Pro doesn’t just drop all these real-life wrestlers into the game alongside its fictional wrestlers and expect you to make up your own storylines, though. It also adds a new mode called Fighting Road, which is basically the story of your original create-a-wrestler rising to the top of New Japan. It’ll be familiar to anybody who’s ever played a career mode in a wrestling game before—the more you win, the higher you climb up the NJPW rankings, with the ultimate goal of wrestling for the biggest title at the biggest show of the year. The concept is familiar, but the presentation is unique for a wrestling game, and could potentially bring in an audience that doesn’t care about wrestling but does care about another kind of game that’s popular in Japan. A visual novel is like a slideshow presentation that you play. It uses text and static images of characters or settings to tell a story that lets the player make decisions at crucial junctures. They’re like Choose Your Own Adventure books turned into software, and often with an anime aesthetic. Visual novels come in various genres, but in America they’re mostly associated with dating sims, where the player flirts and courts various potential love interests. Fighting Road is basically a wrestling visual novel, but with Fire Pro wrestling matches largely deciding the story’s outcome. In Fighting Road my create-a-wrestler, Gary “Guitar” Martin, followed the well-established path of a New Japan wrestler. He started at a tryout, where he impressed the trainers Yugi Nagata and Super Strong Machine. After months of training (which were thankfully summed up and skipped over in a few lines of text) he became what New Japan calls a “Young Lion,” which basically means a rookie who only wrestles opening matches against other rookies or low-card talent. From there he went on excursion to America, where he wrestled for Fire Pro’s fictional promotion SWA, and then returned to New Japan with a new look, a slightly tweaked name (say hello to Bulldog Martin), and a push that quickly made him a friend and partner to Tanahashi and Togi Makabe. He went through New Japan’s whole 2017 schedule, competing in tournaments like the New Japan Cup and G1, wrestling in multi-man tag matches in the smaller shows and having singles matches for various titles at the big events, before culminating in a match at Wrestle Kingdom 2018. The story ended there, whether my character won or lost, after which the game prompted me to immediately start a new journey with a new create-a-wrestler in a different stable. Normally in a wrestling game all this information would be relayed either with minimal storytelling or through unnecessarily elaborate cut scenes. Fighting Road, though, sticks to the visual novel style, using photographs of wrestlers and copious amounts of words to tell its story. 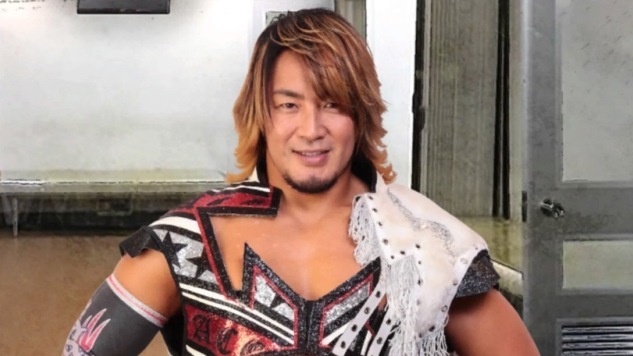 When Hiroshi Tanahashi goes on one of his inspirational speeches about how the most important thing in wrestling is a pure love for the sport, I see a photo of the real Tanahashi tenderly and earnestly smiling back at me. When Minoru Suzuki calls me an idiot and threatens to break me in half, the real Minoru Suzuki glowers at me on my TV screen. These dialogue scenes can go on for a surprisingly long amount of time, and although Fire Pro won’t win any awards for its writing, it does quickly and efficiently establish defined voices for all of its main characters, and sticks to them throughout the game. And although romance isn’t ever an option, I won’t deny that there was a frisson of psychosexual tension between me and Okada. A story mode like Fighting Road only could’ve happened in a Japanese wrestling game. Not just because the visual novel form is essentially unique to Japan, but because the way it presents its characters and the sport of wrestling would never fly with a company like WWE. Fighting Road shows a New Japan roster that’s almost entirely respectful to one another. Tanahashi might not be friends with Okada and his CHAOS stable mates, but there’s no obvious villain in their relationship. Okada was a little smug whenever I spoke to him, but he was still cordial in the end, and spoke highly of my skills. Even on my American excursion, the big heel I feuded with eventually respected me and became one of my character’s closest friends. Japanese wrestling takes a less black-and-white approach to the face-heel dynamic, and books matches between crowd favorites more often than WWE, and that’s reflected in Fighting Road. It’s not perfect, of course. Somehow I wound up holding five different New Japan titles by the end of my story, something which would never happen in real life. The end comes too soon, too—I was hoping to see my champ defend his IWGP Heavyweight title throughout 2018, but win or lose the story ends at Wrestle Kingdom in January. As far as I can tell there’s no way to import my character from the Fighting Road mode to the regular roster or edit mode, which makes all the time I spent creating him and leveling him up feel a little like a waste. Even though I chose the American nationality for my character, the story still referred to him as Japanese, and had some pretty bad jokes about his difficulty understanding English during his excursion. It’s also hard to tell how much winning or losing changes the storyline—I tested out both results on a few major matches, and other than a few lines of dialogue the story seemed to progress the same afterward. Still, Fighting Road achieves something that most wrestling career modes don’t. Despite the lack of motion in its cut scenes, and its often unrealistic story beats (at one point I have to go to New Japan’s corporate offices for a meeting, and when I get there it’s led by Nagata in a NJPW t-shirt and Super Strong Machine in his mask), the thorough text and first-person perspective make me feel closer to this character and more deeply embedded in this world than anything I’ve ever seen in a WWE game. The 2K series tries hard to immerse us in WWE with modern graphics and backstage areas full of wrestlers and random employees, but that only builds separation between us and our character. The visual novel format might seem bare bones and shallow, but in its immediacy and directness there’s an unexpected power. When Gary Martin suits up in a WWE ring in a 2K game, I’m simply controlling a character in a confusing, poorly scripted mess of a story; when he squares off against Hirooki Goto for the NEVER Openweight Championship in Fighting Road, I feel like it’s my own reputation and career on the line. Like New Japan itself, this wrestling game feels realer than its American counterparts, and preserving that illusion of legitimacy used to be the single most important thing a wrestler could do. Fighting Road has created its own kind of kayfabe for wrestling games, and that’s what makes it so great. Garrett Martin edits Paste’s comedy and games sections and also writes about theme parks. He’s on Twitter @grmartin.